Darrel Wade, Jr., 18, of Biscayne, a 3rd form student of New Hope High School, died at about 3:45 yesterday afternoon, Tuesday, in the hospital after he was stabbed three times in his chest and back. Wade was rushed to the Northern Regional Hospital (formerly known as the Orange Walk Hospital), but he died while doctors were operating on him. Police have arrested Wade’s 25-year-old assailant, who handed over the knife with which he stabbed Wade. The incident occurred shortly after classes concluded at New Hope High School. According to police, a witness told them that Gaynair quickly attacked Wade, stabbing him multiple times. The witness said that the attacker then rode away. Wade had run into a store, named “D-Store,” after being stabbed, but when he came out of the store, he was bleeding profusely, and collapsed on the sidewalk. With the aid of some people on the scene, Wade was rushed to the hospital. At 4:35 p.m. while undergoing surgery, however, he succumbed to his injuries. Witnesses who saw what happened described the attacker to police, who knew him, and exactly where he lived. According to police, when they went to Gaynair’s house, he cooperated with them, and he handed over the murder weapon. In an interview today, Inspector Julius Cantun, the Deputy Commander of Orange Walk Police, said that Gaynair exchanged words with Wade, after which Gaynair stabbed him with a butcher knife eleven inches in length, including the handle. Doctors at the hospital worked for about an hour to save Wade’s life, but according to a doctor, Wade died because of a stab wound that penetrated the heart. Wade commuted daily from his home in Biscayne to Orange Walk and back, to attend classes at the New Hope High School. At the time of the tragedy, many students of New Hope High School and Orange Walk Technical High School were walking home from school and saw the incident. The students and the teachers were devastated when a nurse from the medical team went to them and told them that Wade had died. His teacher said that Wade was respectful and ambitious and was a member of the vocational program because he had intended to become an architect and a mechanical engineer. The New Hope High School community is mourning the loss of Wade, who many said was a promising student. Wade’s aunt said that the family is devastated, but are trying to face the reality of the situation. She said that her sister, Wade’s mother, Sarah Wade, was at home when she got a call from the Orange Walk Hospital giving her the terrible news. Her blood pressure immediately rose and remains at an elevated level, the aunt said. The aunt also said that they were all proud of him, because apart from being a promising future engineer, Wade was an athlete and participated in many events at school. A cousin of Wade told Amandala that she was at home when she got a text from her husband, giving her the terrible news. She immediately went to their home to be with her family. 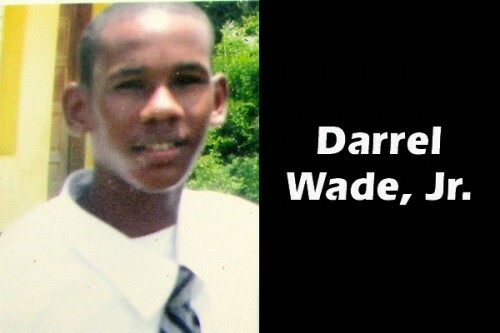 Darrel Wade, Jr., just celebrated his 18th birthday last week. He is survived by his mother; his father, Staff Sergeant Darrel “Duvell” Wade ( BDF Ret. Class 1 Armorer, who was also a member of the now defunct Police Special Force (PSF)); two sisters, Larsha and Larshell; two brothers, Christopher and Leroy Wade; 27 aunts and uncles, and numerous nieces and nephews; and a host of other relatives and friends. His death is also mourned by the wider community of New Hope High School.